10. Afterhours/Voglio una Pelle Splendida/Hai Paura del Bulo? Le Zagazougou (say it five times real fast) are from Côte d’Ivoire; they have a MySpace page. 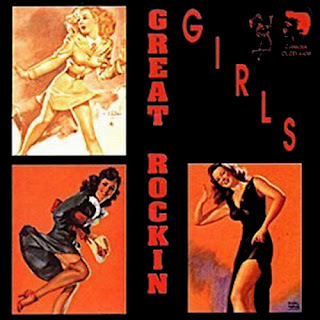 The Great Rockin' Girls anthology is one of three great LPs documenting obscure female rockabilly singers of the 50s, most of whom never even made it up to one-hit wonder status. I was directed towards this treasure trove by Tucson DJ Kidd Squidd, who played one track that caught the attention of my daughter, leading me to hunt down the whole set. The June Carter Cash disc was her last; the recording serves as a sort of epitaph. You can hear Johnny, who followed her into the next world a few months later, singing background vocals. Sawt El Atlas are an Algerian Raï band, based in Paris. That Sergio Mendes classic is remixed, (with his blessings) with new vocals by the Black-Eyed Peas. Purists may slit their wrists, but I am not easily offended. Mendes and will.i.am collaborated again on the Rio soundtrack. Deerhunter, we've talked about before. Love me some Deerhunter. This one's from 2007. Afterhours are an alternative rock band from Milan, Italy, formed in 1985. They have a cult following there and abroad. Go forth and be random.